A while back we showed you a smart-cloud lamp that brought a thunderstorm into your living room (without the rain). It was a little on the expensive side. These handmade Cloud Lights are a fraction of the price and bring a little serendipity to your décor. 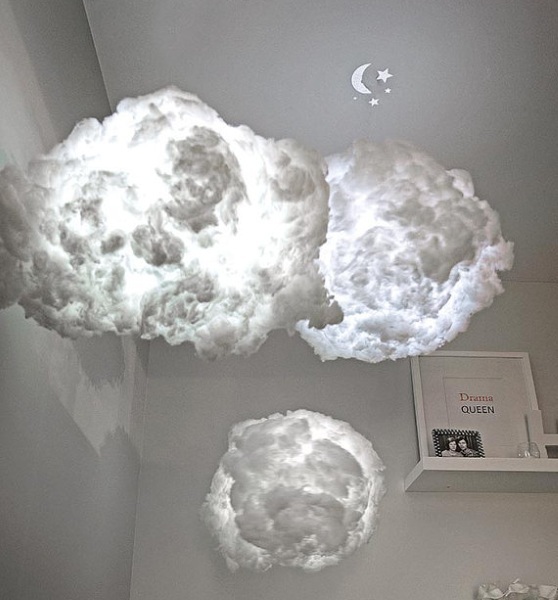 These Cloud Lights are sold individually and are powered on AAA batteries. They are equipped with LED lights that create a soft and romantic glow from the cloud. Like the moon peeking through. Although they don’t come with a sound system, they do include a cute projection of the moon and stars to decorate the ceiling of the room. You can buy more than one and cluster them throughout the room you are looking to decorate for a cloudy day effect. They come in two sizes, small and large, so if you decide to do something more artistic with your lighting, you can really add some variation to the room. These were designed for children’s rooms but there’s no reason they can’t find a home in any room of your home or office. The Cloud Lights start at $74.77.